This tune made my 2018 Cruze into the car it should've been when it was delivered from the factory. Absolutely a major upgrade for minimal cash. When I'm feeling mellow, I can get 40-42 mpg on the highway, just like the stock tune. If I feel like letting it all hang out, it's a heck of a fun ride. You won't take a Corvette or anything like that, but I've surprised more than one 3-series BMW and Audi A4. I've found that turning off the traction control so it doesn't get in the way helps. I have a manual transmission (yes, the gearing is stupidly wide spaced) and the engine is totally stock right down to the air filter. Your results may vary, but I can hit the redline in 5th gear at a speed not recommended unless you've done something to fix the hatchback aerodynamics. There were a few hiccups at the outset, but the Trifecta Team's customer service has been first rate and my tune is awesome. Exactly as advertised... As so many others have stated, this makes the Cruze perform the way GM "should" have built it. This tune won't turn the car into a high performance machine, but it will put the fun back into driving it - putting a smile on your face. A must have - great work on Trifecta's part. (if only they could fix the horrible gear ratios in the manual trans - such tall gearing for fuel economy kills it - with this tune and the right gearing you could truly make a hot hatch out of this car). Oh well - still fun to drive now. I can not believe what a difference this calibration made to my Cruze! In just a few minutes it went from a mild-mannered gas saver to a car that is incredibly fun to drive. Everything feels different, from the throttle response to the torque, it feels like a completely different car than what I left the dealership with. My fuel economy averages slightly better when driving normally, and the local youngsters with mustangs and Camaros hate what it can do from a stop light. Trifecta's customer support is excellent! If you are on the fence about a calibration, do it! You will be amazed at what your Cruze can do! Awesome tune. Never thought there would be that much of an increase of power to my 2016 Cruze. Night and day difference. And the support is excellent. Every question I had they answered quickly. Had a ‘15 Cruze with Trifecta Mod, couldn’t live without it with that small motor. Went to a 2.0 Malibu and ran stock, the car was amazing. Traded it back to an ‘18 Cruze RS Redline and really missed the power of the 2.0. 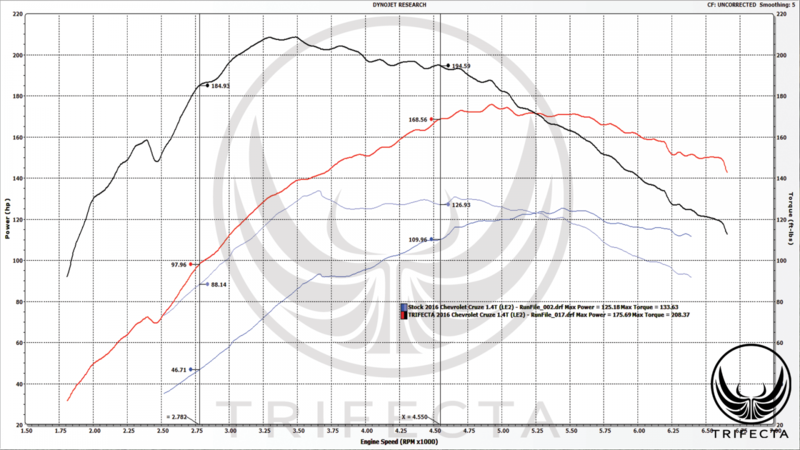 Compared to the first Cruze stock, the new LE2 motor performed better, but really not enough to make it enjoyable. Purchased Trifecta Mod for the new ‘18 1.4t Cruze and — wow! Not the performance of the 2.0 Malibu, but definitely how this car should be from factory. Passing on 2 lane roads, not a problem. Highway/ On-ramp acceleration - not a problem. I still believe we can get more out of this motor with a stock setup, but I understand Trifecta peeps have their reasons for not maxing the boost out. If you’re debating or looking into the benefits of this mod, stop. Buy it, you won’t regret it. Your Cruze will feel “confident” on the road. The way the car should be. I swear this makes this car feel alive! Really responsive, smooth and smart shift points and really gets up and goes when you floor it! Night and day driving difference compared the stock. If you have a car compatible with Trifecta then do not hesitate to get your car enhanced! You'll actually love your car more than you did before! Gas milage is better (when not driving too hard) and I don't have to mess with the odd transmission logic for downshifts and odd acceleration points. Definitely recommended to have a good time. I've been using this tune for just about a full year now, save a couple weeks, and close to 35,000 miles within that year. This tune is hands down the best money I've put into this car, feels like it should have come from the factory this way. The transmission doesn't feel confused anymore, power from 3rd+ is absolutely wonderful for a little 1.4T. As for other reviews, yes, you will not be spanking any high powered cars such as a 5.0 'stang, 'vettes, SRT-8s, etc. BUT you will be faster than most of the vehicles on the streets. Hell, I've pulled away from both a RWD and AWD Infiniti G35 (separate occasions of course), most cars around that HP range will take you from the line but from a roll it's a different story. Also, sometimes it's fun to give about half throttle and watch your headlights raise up from the acceleration, then drop back down as soon as you let off with a tiny little BOV "psssewwww." I will admit there has been slight hiccups, but the customer service offered by Trifecta is second to none. They are incredibly responsive, actually care about your vehicle and will attempt any way within their power to make things right with your situation. That perk in itself is worth the price, a company that actually cares about service after the sale. I truly like this tune. My Cruze drives and performs much better. I had to obtain the services of a computer guy in order to install the tune, but it was well worth the effort and the modest added cost. I think my fuel mileage is at least as good as stock, maybe little better, but I'm using 93 octane gas. The added power is really remarkable and I assume this is because the car is turbocharged and the boost is higher with the tune. Shifting is much improved and optimized for performance. Throttle response is crisp and predictable. I now have complete confidence in the car when I need to merge into traffic or pass another vehicle. No more hoping for a proper downshift or worrying about the car missing a beat when I step on the accelerator to accelerate after the auto stop was engaged. I really liked my Cruze before the tune, primarily because of the great fuel economy, the roomy interior (for a compact car), and its good looks. Now the car is really fun to drive and that is a real plus. Now I REALLY like my Cruze. I always look forward to driving the car now that it performs so well. I heartily recommend this tune to those who enjoy a vehicle that is fun to drive. I never really loved my Cruze too much because there was always just something missing when driving it daily to and from work. It was just a bit of a boring driver. Very mediocre power, lazy responses from the gas pedal and transmission. Then come the purchase of the Trifecta tune and MY "tune" about the Cruze has definitely changed. The tune has definitely woken the car up. Before I constantly felt like I wished the car had more power, especially in scenarios where I needed to pass someone,or merge into traffic, or entering the highway. Post tune, I no longer have any driving scenarios where I feel like I NEED more power out of the car. The power is just there, and it comes on early, and it comes on strong. The 3,000 to 4,000 RPM range is especially strong on the car after the Trifecta tune. It will put a smile on your face and is hands down the best bang for your buck upgrade. The flashing process was easy, the customer support and response times were also quick. I never went more than 24 hours before hearing back for any suggestions, questions, or concerns. Great work on this new tune for the 2016+ Cruze, I'm a fan! I run nothing but 93 octane in my Cruze and recommend that anyone else do too for best performance. I really don't think anyone would regret applying this to their Cruze. So far I have over 300 miles on the tune and loving it. The only negative I can give is that it takes a little bit to get used to the difference in how the car drives. I keep finding myself excessively speeding because it gets up to speed so much quicker. I bought another great tune for my new car. This added a degree of power and certainty makes the car more fun to drive and a better merger on the freeway. The shift points are better as well and doesn't feel like it is confused anymore. I would recommend this wholeheartedly. My MPG has gotten slightly better over stock. Of course if hitting the pedal hard you may lose a bit, but much more fun. I do run 91 or better octane but I do this in all of my turbo cars. As always the support is outstanding and my questions are answered quickly. I will use these guys again and would think after trying this you will too!! Thanks for an amazing product .